Alright, so I took the picture a day early and am posting a day late… which pretty accurately describes how this week went! For work I had to travel the first part of this week to New Orleans for a convention. And let me tell you… NOLA the week after Mardi Gras is not the most ideal place for a pregnant woman. Let’s just say I’m ready for my sense of smell to return to normal. Plus this convention requires a lot of walking! My coworker who was wearing a pedometer (and who I spent most of the days with ) got 15,000+ steps every day. So I am a bit exhausted and ready to put my feet up and do NOTHING for a few days. But enough excuses for why I am late with the post… Here you go! Baby’s Size: a Spaghetti Squash- and she weighs approximately 1lb. But apparently from here on out she ramps up the growth, so she should be gaining a 6 ounces in the next week! Baby’s Progress: Baby girl is still kicking and moving around quite a bit, but of course stops any time I try to get Reese to feel her move, so he is definitely wishing he could feel her move more! Her lips, eyelids and eyebrows are growing more distinct and she is starting to grow tooth buds! Weight Gain: About 1/2 a lb, which puts me up about 3 lbs from where I started. Sleep: Not sure if it was the guy playing saxophone loudly outside my hotel (I was on floor 25 and could still hear him) or the pregnancy… but I’ve had better nights of sleep. Although last night in my own bed I slept like a rockstar. So I’m grateful for a few good nights of sleep! Milestones: I can’t really think of any milestones for this week… except for maybe that baby girl got a taste of Creole food? 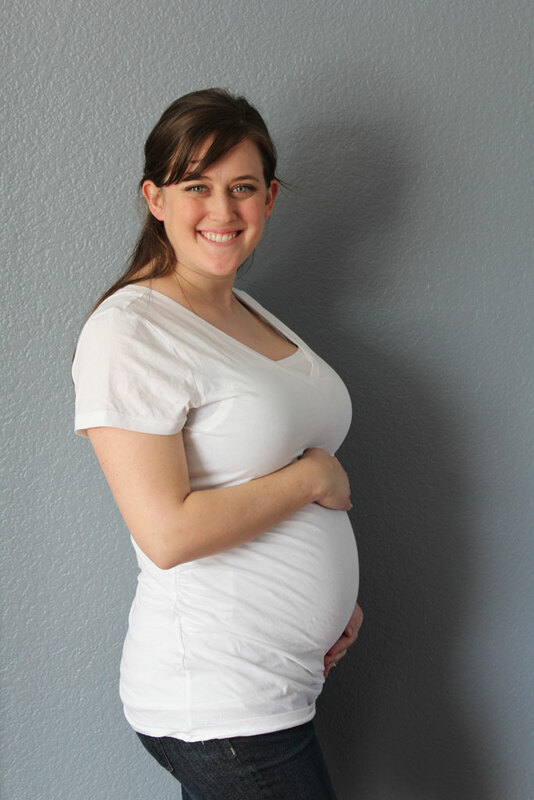 Favorite clothing item of the week: Pregnancy tank tops! I bought a couple of them at Target and they definitely saved me this week when I had to wear my work polo and it was just a bit shorter in front that in should have been… tank tops to the rescue! Symptoms: OOOOOH after walking so much my feet and my back were aching for certain! I could definitely feel the exhaustion faster! But I successfully finished the convention and other than taking it easy for the next few days, I’m no worse for the wear! Workout: Walking, Walking, More Walking. Bonus Story: On my flight to New Orleans I was on Southwest Airlines, so of course it is open seating. Well I hadn’t remembered to check in early enough so was pretty far down in the C-lineup to get to pick a seat. So as I’m getting on the plane I see an open window seat and bonus a spot above it for a roller bag. So I ask the woman and her 10 year old son if someone was sitting there, and they assured me that no, no one was. So I put my bag up above and the woman gets up from her seat. The 10 year old doesn’t move. I sit and look at him for another second, but the line behind me is growing and it is clear that he wasn’t going to move. So me, my big ol’ belly and my computer bag have to climb over the 10 year old to get into my seat. Let me tell you, I was the definition of graceful. (That was sarcasm for those of you who struggle to identify it) And I was definitely sweating as I fell into my seat. Maybe one day that kid will learn that it is less unpleasant to get up out of your seat than to have a pregnant woman crawl over you complete with heavy computer bag. Love you and your baby!